Introduction Blood blister-like aneurysms (BBAs) are fragile and difficult to treat. Routine surgical and endovascular treatment methods, such as clipping, clip wrapping, primary coiling, or stent assisted coiling, have relatively high morbidity and mortality rates. In this study, we report clinical and angiographic results for treatment of ruptured BBAs using flow diverter stents. Methods We retrospectively reviewed patients who presented with subarachnoid hemorrhages caused by rupture of BBAs and who were treated using flow diverter stents at three neurointervention centers between January 2009 and January 2013. Clinical and angiographic findings, together with the procedural data and follow-up results, are reported. Results 11 patients were identified in this study. BBAs were located on the supraclinoid internal carotid artery (nine patients) and basilar arteries (two patients). Eight patients were treated by implantation of a single flow diverter stent. Two flow diverter stents were telescopically deployed in each of three patients. The procedures were successful in all cases. No acute complications developed in any case. One patient who had an initial Hess–Hunt grade 4 died of septicemia 2 weeks after the procedure (9%). Another patient developed a minor stroke caused by parent artery thrombosis (9%). 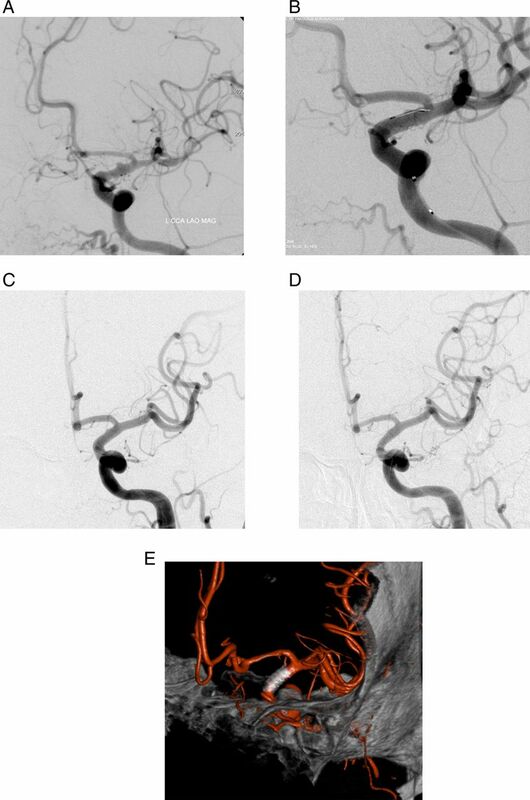 Control angiographies performed 3 and 6 months post stenting revealed complete occlusion of the aneurysms in all of the remaining nine patients (82%). 10 of the 11 patients (92%) had good clinical outcomes (modified Rankin Scale score ≤2). Conclusions Implantation of flow diverter stents seems to be a safe and feasible alternative for treatment of ruptured BBAs. An optimal treatment method for BBAs has not yet been defined. Treatment of BBAs with routine surgical and endovascular methods, such as clipping, clip wrapping, and primary or stent assisted coiling, have relatively high morbidity and mortality rates.1–11 Because BBAs have thin and fragile walls, the risk of intraoperative rupture during surgical clipping is high.1 ,3 ,5 Furthermore, intraoperative ruptures occur in the form of parent artery tears or avulsions, which frequently lead to parent artery sacrifice.1 ,3 ,5 Similarly, primary or stent assisted coiling of these small and fragile aneurysms carries a high risk of intraprocedural rupture and postoperative hemorrhage.6 ,10 ,12 Moreover, coiling cannot constitute a definite treatment for BBAs because of the high rate of early regrowth and rebleeding after the coiling of BBAs.7 ,9 Parent artery trapping has been suggested as a safe and definite treatment method in patients who tolerate a preoperative balloon occlusion test.9 However, Meiling et al4 reported a poor outcome after parent artery sacrifice for the treatment of BBAs, even in patients with a good preoperative collateral capacity. They hypothesized that development of vasospasm would further decrease the collateral capacity of the cerebral vasculature that was already reduced by parent artery occlusion. Recently, flow diverter stents have been developed to treat wide neck, complex, fusiform, and very small intracranial aneurysms, which are difficult to treat by other endovascular methods.13–15 Flow diverter stents have a high capacity to reconstruct arterial blood flow in the parent artery, which diminishes flow and gradually induces thrombosis in the sac of the aneurysm. Here we report the experiences of three neurointervention centers involved in the treatment of ruptured BBAs by implantation of SILK flow diverter stents (Balt Extrusion, Montmorency, France) in a series of 11 patients. This retrospective study was approved by the local institutional review boards. We retrospectively reviewed the records of our interventional neuroradiology departments to identify patients with a BBA who were treated via implantation of flow diverter stents at three centers between January 2009 and January 2013. An aneurysm located in the non-branching sites of supraclinoid internal carotid or basilar arteries with a typical blister-like shape was defined as BBA. The initial and follow-up clinical data, technical results, and angiographic findings of the patients were assessed. All of the patients presented with subarachnoid hemorrhages, and their cerebral DSA examinations revealed a diagnosis of BBA in all cases. No other possible cause of subarachnoid hemorrhage was identified by cerebral DSA. The initial clinical states of the patients were evaluated by the Hunt and Hess grading system. All of the patients were treated using implantation of flow diverter stents (SILK). We did not perform the endovascular treatment urgently after the diagnosis of BBA. Because organization of the blood clot covering aneurysmal sac would make the operations safer, we aimed to postpone the endovascular treatments for at least 5 days.1 Patients were managed conservatively in intensive care units until the endovascular treatment commenced. During this conservative management period, ventricular sizes and the development and degree of vasospasm were closely followed using cranial CT and transcranial Doppler ultrasonography. In the transcranial Doppler examinations, a blood flow velocity >200 cm/s in the middle cerebral artery territories was accepted as a significant radiological finding of cerebral vasospasm.16 Possible changes in the size or morphology of the aneurysms during the conservative management period were evaluated by intracranial CT angiography examinations up to the time of the endovascular procedure. All endovascular procedures were performed with the patients under general anesthesia. Systemic anticoagulation was started immediately after insertion of a femoral introducer with a bolus dose of 5000 IU of heparin. The bolus dose was followed by a slow heparin infusion to maintain the activated clotting time >2 times the baseline value. At the beginning of the procedure, a distal access guiding catheter (Fargo; Balt) was placed into the cervical segment of the target artery (the internal carotid and vertebral arteries). A stent delivery microcatheter (Vasco 21; Balt) over a 0.014 inch guide wire (Transend, Styriker or Traxcess, MicroVention) was crossed distal to the aneurysm. Then, SILK stents were deployed into the parent artery covering the neck of the aneurysm. After deployment of the SILK stent, immediate control DSA images were obtained to assess the apposition of the stent, the patency of the parent/distal arteries, and filling of the aneurysms. Dual antiplatelet therapy was started just 12 h prior to the endovascular procedures with loading doses of 300 mg of aspirin and 600 mg of clopidogrel. The effectiveness of platelet inhibition was tested before the procedure (VerifyNow; Accumetrics, San Diego, USA). Postprocedural dual antiplatelet treatment, including 75 mg/day clopidogrel and 300 mg/day of aspirin, was continued for 6 months. At the 6 month follow-up, clopidogrel was stopped, and the dose of aspirin was reduced to 100 mg/day. Because BBAs are known to be unstable with respect to size and morphology, before discharge of patients from hospital, we performed short term control DSAs to assess the early effects of the stents on the filling and morphology of the aneurysms. Further long term angiographic and clinical follow-ups were performed at 3 and 6 months after the endovascular procedures. The clinical states of patients at the follow-ups were evaluated using the modified Rankin Scale (mRS). The patency of the parent arteries, presence and degree of in-stent stenosis, and filling of the aneurysms were evaluated at follow-up angiographic controls. The filling states of the aneurysms were evaluated and classified as defined by Roy et al.17 According to this classification system, class 1 indicates complete obliteration of the aneurysm; classes 2 and 3 are characterized by a residual neck and residual filling of the aneurysmal sac, respectively. This retrospective study included 11 patients (nine women and two men) with a mean age of 50.2±11.2 years (range 36–68). All of the patients presented with subarachnoid hemorrhages diagnosed by unenhanced cranial CT. Cerebral DSA examinations revealed BBAs in the non-branching supraclinoid segments of the internal carotid arteries in nine cases and in the lateral walls of the basilar arteries in two cases. The initial Hunt and Hess grade was 1 in four patients, 2 in six patients, and 4 in the other patient. Demographic data and presenting clinical and angiographic findings of the patients are summarized in table 1. During the conservative management period lasting up to the endovascular procedures, follow-up CT angiography examinations did not reveal any changes in the size of the aneurysms. Cranial CT images of two patients (patient Nos 2 and 5) revealed progressive increases in ventricular size, and ventricular drainage was performed for these patients before endovascular treatment. Transcranial Doppler examinations did not reveal a significant change in middle cerebral artery velocity in any patient. The mean duration between subarachnoid hemorrhage and endovascular procedure was 9.6±3.6 days (range 5–15 days). Only single flow diverter stents were deployed in seven patients. In three patients (patient Nos 2, 4, and 10), two flow diverter stents were telescopically implanted into the supraclinoid segment of the internal carotid arteries, covering the neck of the aneurysms. In one patient (patient No 3), the immediate control DSA images taken just after implantation of the flow diverter stent demonstrated malapposition of a short stent segment to the walls of the internal carotid artery. Deployment of a closed cell design self-expandable stent (Enterprise; Cordis) inside the malapposed segment achieved good wall apposition of the flow diverter stent in this patient. Deployment of the flow diverter stents was successful in all cases (figures 1–⇓⇓4). Procedure related acute complications did not occur in any case. Postprocedural immediate control angiography revealed residual filling of the aneurysmal neck (class 2) in one patient and residual filling of the aneurysmal sacs (class 3) in the remaining 10 patients. (A) Preprocedural DSA image of a 43-year-old woman (patient No 6). The preprocedural DSA image shows a blister-like aneurysm located on the anterior wall of the supraclinoid segment of the left internal carotid artery. (B) Immediate DSA image taken just after deployment of a SILK stent covering the neck of the aneurysm reveals minimal residual filling of the neck of the aneurysm (class 2). (C) The short term control DSA image shows minimal residual filling in the neck of the aneurysm (class 2). (D) The 3 month follow-up DSA image illustrates complete obliteration of the aneurysm. (E) The 3 month follow-up rotational three-dimensional angiography image demonstrates complete obliteration of the aneurysm. (A) Preprocedural DSA image of a 56-year-old woman (patient No 4). The image shows a blister-like aneurysm located on the anterior wall of the supraclinoid segment of the left internal carotid artery. (B) The non-subtracted DSA image shows the telescopic deployment of two SILK flow diverter stents. (C) The short term control DSA image reveals residual filling of the aneurysm (class 3). (D) The 3 month follow-up DSA image illustrates complete obliteration of the aneurysm. (A) Initial cranial CT image of a 57-year-old woman (patient No 10). The image shows the subarachnoid hemorrhage in the frontal sulci. (B) Preprocedural DSA image reveals a wide necked blister-like aneurysm located on the anterior–lateral wall of the supraclinoid internal carotid artery. (C) Preprocedural DSA image reveals a wide necked blister-like aneurysm located on the anterior–lateral wall of the supraclinoid internal carotid artery. (D) The 3 month follow-up DSA image shows complete occlusion of the aneurysm. (A) Preprocedural cranial CT DSA image of a 47-year-old woman (patient No 5). The cranial CT image on the axial plane demonstrates the intraventricular hemorrhage and dilatation of the lateral ventricles. (B) The maximum intensity projection CT angiography image (reconstructed on the coronal plane) shows a wide necked small aneurysm on the lateral wall of the basilar artery. (C) The preprocedural DSA image demonstrates a blood blister-like aneurysm on the non-branching lateral wall of the basilar artery. (D) The short term control DSA image shows stagnated residual filling of the aneurysm (class 3). (E) There is no aneurysmal filling in the 3 month follow-up DSA image (class 1). Short term control DSAs were performed before the patients were discharged from hospital. The mean interval between the endovascular procedure and short term control DSA was 9.7±3.6 days (range 1–15 days). The short term control DSAs showed complete obliteration of the aneurysms (class 1) in only one patient, residual filling of the aneurysm neck (class 2) in another patient, and residual filling of the aneurysmal sac (class 3) in the remaining nine patients (table 2). One of the patients (patient No 2) who had had an initial Hunt and Hess grade of 4 remained intubated and died of septicemia 12 days after the endovascular procedure. During the follow-up period, one patient (patient No 3) developed transient hemiparesis 23 days after the endovascular procedure. His detailed clinical history revealed that he had decided to stop the antiplatelet medications himself. Control cerebral DSA performed 24 days after the endovascular procedure demonstrated occlusion of the parent artery. However, the collateral flow from the anterior communicating artery was adequate to prevent a large cerebral infarction. The patient remained symptom-free, and no further control DSA was performed. Follow-up DSAs 3 months after the endovascular procedures were performed in nine patients. These DSAs showed complete obliteration of the aneurysms (class 1) in all nine patients. A mild degree of in-stent stenosis (<20%) was detected in the 3 month control DSA images of two patients, which did not cause any symptoms. Follow-up control DSA examinations 6 months after the endovascular procedure were performed in nine patients. At these 6 month follow-up DSAs, there was no recanalization of the aneurysm in any case. Clinical control examinations at 6 months revealed a good outcome in all 10 patients (mRS scores 0–2) (table 2). Autopsy studies have demonstrated that BBAs are not true aneurysms2; they are actually pseudoaneurysms caused by the dissection of an arterial wall. Histologically, the walls of BBAs lack internal elastic lamina and media layers and are composed of only blood clots, fibrous tissue, and adventitia.2 Mizutani and Kojima18 suggested that a BBA is a specific type of arterial dissection with a focal defect of the internal elastic lamina. Because of these unique histopathological features, treatment options directed toward the aneurysmal sac of BBAs have disappointing results.1–7 Microsurgical manipulations to clip the sacs of BBAs carry a high risk of intraoperative rupture, resulting in arterial wall defects that frequently lead to sacrifice of the parent artery.1 ,3 ,5 Similarly, there is a high risk of rupture during microcatheter manipulation and coil placement in such fragile and small aneurysms.19 ,20 Moreover, because the sacs of BBAs lack a true wall and because the main pathology creating BBAs is more extensive in the parent artery beyond the aneurysmal neck, surgical and endovascular treatment methods targeted to the aneurysmal sac are associated with high regrowth and rebleeding rates.5 ,7 ,8 Therefore, a definitive reconstructive treatment of BBAs should target the diseased segment of the parent artery. Flow diverter stents are relatively new endovascular devices designed to treat giant/wide neck, dissecting/fusiform, or very small intracranial aneurysms.13–15 ,26–30 They have lower porosity and higher metal coverage ratios than conventional self-expandable intracranial stents. Because of these structural features, flow diverter stents have much higher flow diversion capacities than conventional self-expandable intracranial stents. A SILK is a self-expandable stent that is composed of 48 nickel–titanium alloy (nitinol) microfilaments.15 When deployed to cover the orifice of an aneurysm, it redirects blood flow from the sac of the aneurysm to the distal parent artery, which causes stagnation and gradual thrombosis of the aneurysmal sac. Furthermore, neointimal overgrowth induced by the flow diverter stent leads to healing of the aneurysm neck and remodeling of the diseased parent artery. Although implantation of a flow diverter stent creates an immediate hemodynamic effect in the parent artery and aneurysmal sac, progressive thrombosis and complete occlusion of the aneurysm occur within weeks after the procedure. During this ‘latency period,’ there is a risk of rerupture or rebleeding. Moreover, the use of antiplatelet therapy in the treatment of ruptured aneurysms is controversial. The results of stent assisted coil embolization studies suggest that antiplatelet treatment could be started in patients with acute subarachnoid hemorrhage with acceptable complication rates.33 However, dual antiplatelet treatment increases the risk of intraventricular or intraparenchymal hemorrhage in patients requiring ventricular drainage.35 Together with the requirement for dual antiplatelet therapy, the slow and progressive nature of flow diversion treatment constitutes an important concern regarding the use of flow diverter stents in the treatment of BBAs. In our cases, we preferred not to give antiplatelet therapy during the early post-rupture period, in which the risk of rerupture/rebleeding was relatively high. We postponed stent implantation and, consequently, antiplatelet therapy for at least 5 days to allow the maturation of clots and fibrous tissue on the walls of the aneurysmal sacs. Moreover, flow diverter stent implantation resulted in the immediate exclusion of the aneurysm in none of our cases, but residual aneurysmal neck or sac filling occurred in all cases. No rebleeding or hemorrhagic complications developed in any of our patients. Similar to our experience, previous case series reporting flow diverter stent use in the treatment of ruptured BBAs did not present rebleeding or hemorrhagic complications.30–34 Taken together, these results suggest that the immediate hemodynamic effects of flow diverter stents play an effective role in preventing the rebleeding or rupturing of BBAs. Acute relief of hemodynamic stress on the fragile wall of a BBA may be sufficient to cause rupture during the latency period until obliteration of the aneurysm has been completed. The relatively small sample size and lack of a control group limit the current study from providing strong conclusions. The unique histopathologies of individual BBAs cause them to exhibit variability in clinical progression. BBAs can evolve into different shapes and sizes during the clinical management period, which would alter the timing and strategy of treatment. Among our patients, we did not observe any increase in the size of the aneurysms during the period of conventional clinical management; therefore, a change in our treatment strategy was not required. However, worsened progression in a patient, such as a rapid increase in the size of the aneurysm or rebleeding during the conservative management period, would have changed the timing of the procedure or even the whole strategy of the treatment. Therefore, this case series could not answer the question of which method should be used routinely in the treatment of BBAs, although it demonstrated promising results for flow diverter stent implantation for the treatment of BBAs. In conclusion, treatment of patients with a ruptured BBA by flow diverter stent implantation resulted in good clinical outcomes in 91% of patients, with a parent artery patency rate of 82%. Thus the results of this study indicate that implantation of flow diverter stents is a safe and feasible alternative for treatment of these dangerous aneurysms.
. Blood blister-like aneurysms of the internal carotid artery. Neurosurgery 1998;89:419–24.
. Pathological consideration of a ‘blister-like’ aneurysm at the superior wall of the internal carotid artery: case report. Neurosurgery 1997;40:403–6.
. Aneurysms at nonbranching sites in the surpaclinoid portion of the internal carotid artery: internal carotid artery trunk aneurysms. Neurosurgery 2000;47:578–86.
. Blood blister-like aneurysms of the internal artery trunk causing subarachnoid hemorrhage: treatment and outcome. Neurosurgery 2008;108:662–71.
. Blood blister-like aneurysms at nonbranching sites of the internal carotid artery. Neurosurgery 2006;105:400–05.
. Arterial suturing followed by clip reinforcement with circumferential wrapping for blister-like aneurysms of the internal carotid artery. Surg Neurol 2006;66:424–9.
. Reconstructive treatment of ruptured blood blister-like aneurysms with stent and coil. Neurosurgery 2013;73:480–88.
. Reconstructive endovascular treatment of ruptured blood blister-like aneurysms of the internal carotid artery. Neurosurgery 2009;110:431–36.
. Endovascular treatment of blood blister-like aneurysms of the internal carotid artery. Neurosurgery 2007;106:812–19.
. Clinical and angiographic results of coiling of 196 very small (<3 mm) intracranial aneurysms. 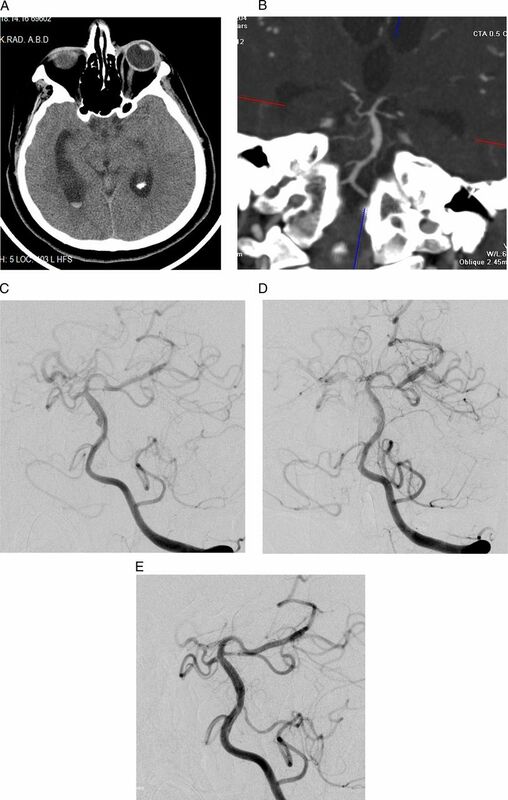 AJNR Am J Neuroradiol 2009;30:835–9.
. Endovascular treatment using predominantly stent-assisted coil embolization and antiplatelet and anticoagulation management of ruptured blood blister-like aneurysms. AJNR Am J Neuroradiol 2011;32:764–71.
. Association of endovascular therapy of very small ruptured aneurysms with higher rates of procedure-related rupture. Neurosurgery 2008;108:1088–92.
. Flow-diverter stent for the endovascular treatment of intracranial aneurysms: a prospective study in 29 patients with 34 aneurysms. Stroke 2010;41:2247–53.
. Flow diversion for intracranial aneurysms: a review. Stroke 2011;42:2363–8.
. Flow-diverter Silk stent for the treatment of intracranial aneurysms: 1-year follow-up in a multicenter study. AJNR Am J Neuroradiol 2012;33:1150–5.
. Role of transcranial Doppler monitoring in the diagnosis of cerebral vasospasm after subarachnoid hemorrhage. Neurosurgery 1999;44:1237–47.
. Endovascular treatment of unruptured aneurysms. Stroke 2001;32:1998–2004.
. Clinicopathological features of non-atherosclerotic cerebral arterial trunk aneurysms. Neuropathology 2000;20:91–7.
. Primary treatment of blood blister-like aneurysms with stent-assisted coil embolization: report of two cases. Acta Radiol 2008;49:180–3.
. Endovascular coil embolization for saccular-shaped blood blister-like aneurysms of the internal carotid artery. Acta Radiol 2011;153:287–94.
. Self-expandable stent-assisted coiling of wide-necked intracranial aneurysms: a single-center experience. AJNR Am J Neuroradiol 2005;26:1223–31.
. Using Leo Plus stent as flow diverter and endoluminal remodeling in endovascular treatment of intracranial fusiform aneurysms. J Neurointervent Surg 2013;5(Suppl 3):iii22–7.
. Stenting as monotherapy for uncoilable intracranial aneurysms. Neurosurgery 2013;73(Suppl 1):80–5.
. Multiple overlapping stents as monotherapy in the treatment of ‘blister’ pseudoaneurysms arising from the supraclinoid internal carotid artery: a single institution series and review of the literature. J Neurointervent Surg 2014;6:184–194.
. The efficacy of endovascular stenting in the treatment of supraclinoid internal carotid artery blister aneurysms using a stent-in-stent technique. AJNR Am J Neuroradiol 2010;31:1132–38.
. 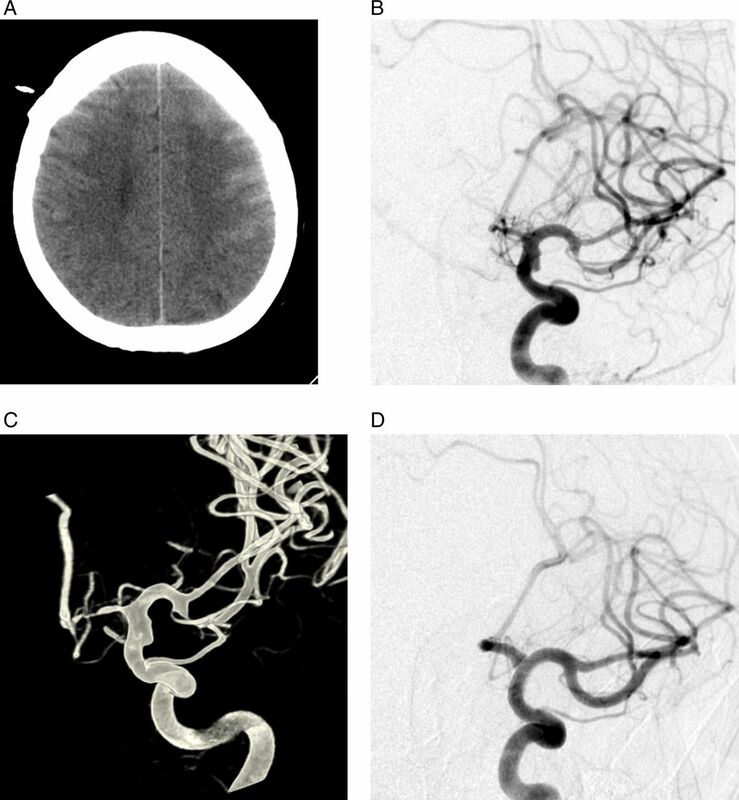 Early and midterm results of complex cerebral aneurysms treated with Silk stent. Neuroradiology 2012;54:1355–65.
. 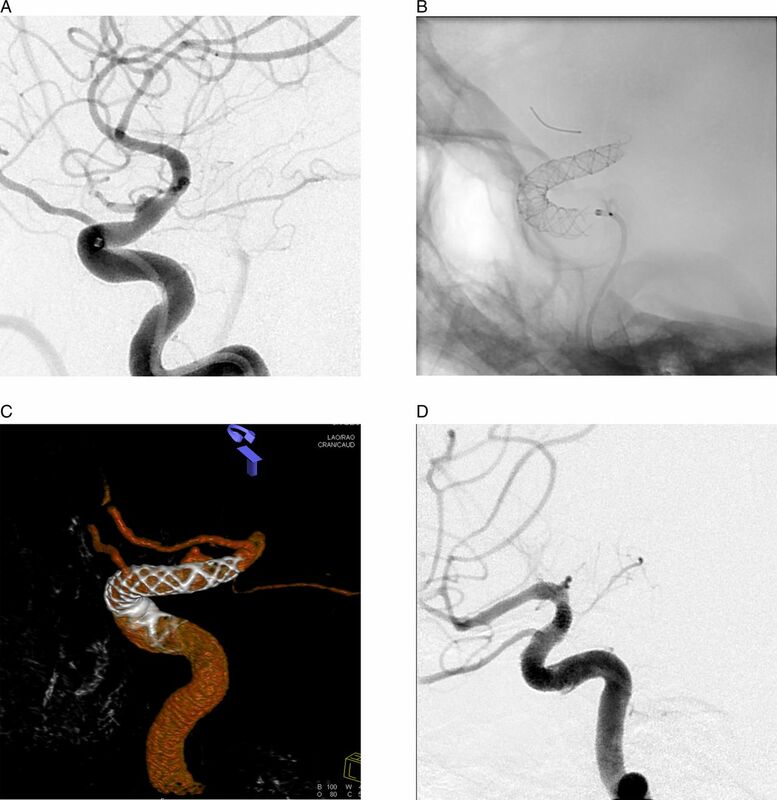 The Silk flow-diverting stent in the endovascular treatment of complex intracranial aneurysms: technical aspects and midterm results in 24 consecutive patients. Neurosurgery 2012;70:617–24.
. Flow diverters for treatment of intracranial aneurysms: Current status and ongoing clinical trials. J Clin Neurosci 2011;18:737–40.
. Effect of flow diversion treatment on very small ruptured aneurysms. Neurosurgery 2010;67:789–93.
. Treatment of two blood blister-like aneurysms with flow diverter stenting. J NeuroIntervent Surg 2012;4:e4.
. Endovascular treatment of a ruptured blood blister-like aneurysm with a flow-diverting stent. Interv Neuroradiol 2010;16:255–8.
. Staged treatment of a blood blister-like aneurysm with stent assisted coiling followed by flow diverter in-stent insertion: a case report. Interv Neuroradiol 2010;17:365–70.
. The pipeline flow-diverting stent for exclusion of ruptured intracranial aneurysms with difficult morphologies. Neurosurgery 2012;70(Suppl 1):21–8.
. Endovascular treatment of ruptured blister-like aneurysms with special reference to the flow-diverting strategy. Neuroradiology 2013;55:441–47.
. Intracranial hemorrhage associated with stent-assisted coil embolization of cerebral aneurysms: a cautionary report. J Neurosurg 2008;108:1122–9. Contributors All authors contributed extensively to the work presented in this paper. KA was involved in the conception, design, acquisition, and analysis of the data, and drafting of the article. AA, BH, and SS were involved in the acquisition and analysis of the data, and drafting of the article. MB was involved in the drafting of the article. AS and NI were involved in the acquisition of the data. Ethics approval The study was approved by the local ethics committees.